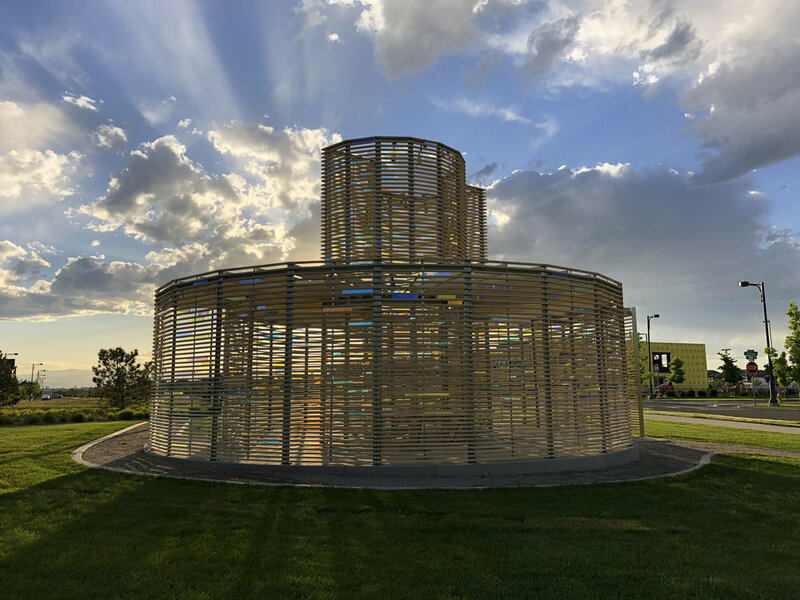 Located in Northfield's Uplands Park in Stapleton, CO, Catherine Widgery's Woven Light is the newest addition to the Denver Public Art Collection. Woven Light is an outdoor room; you are inside and outside at the same time and the shadows, light and projected color make you more conscious of the sun and the breeze than if you were standing in the open. When seen from the outside, the dichroic glass between the slats reflects the sky and surrounding trees. Inside is like being in a kaleidoscope of moving colored lights on the darkened interior as the sun shifts angle. We can look through the openings or through the glass that changes the color of the landscape like a lens. 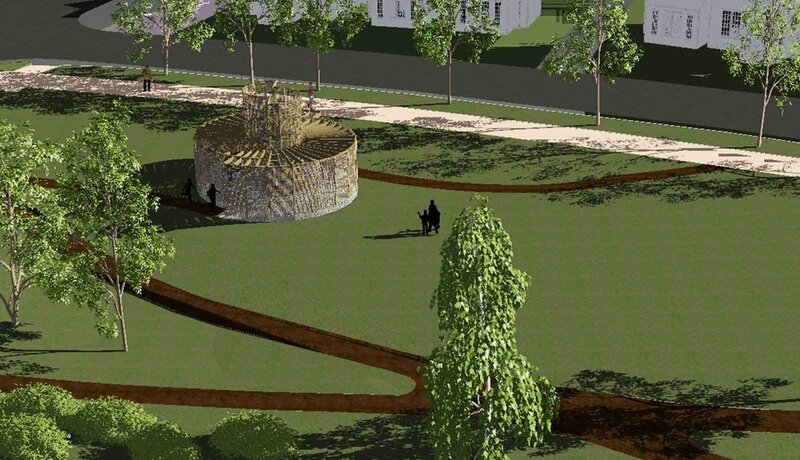 Endlessly changing patterns of crisscrossing shadows and reflected light within and on the ground dematerialize the structure and make a rich shadow on the ground extending the impact of the art beyond its physical boundaries. Woven Light is a shady refuge from the intensity of the prairie light. The angle of the slats will always cast shadow somewhere in the structure no matter where the sun. Seating along the curved walls inside encourages people to stay and ponder the light and space. Woven Light is a structure through which we discover the beauty that surrounds us: the sky, mountains in the distance, sunlight and leaves on the nearby trees moving in the wind. Images and text from Catherine Widgery: widgery.com. Photography by Eve Chayes Lyman. Footage taken during the dedication of Catherine Widgery's newest work of public art, 'Woven Light,' as it was welcomed into Denver's Public Art Collection. 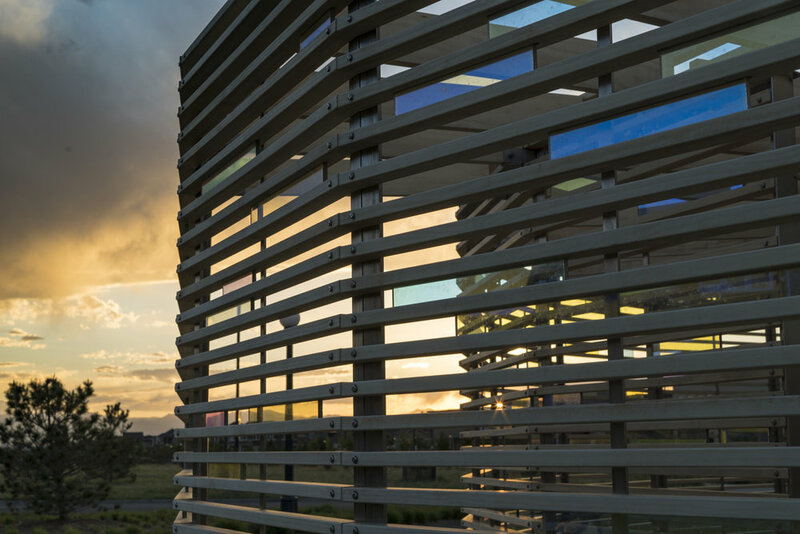 Watch as nearly 30 DPS students and community members explore this stunning structure which encourages both exploration of the space and the surrounding naturals elements.